The 15th Biennial Challenger Conference for Marine Science recently took place at the University of East Anglia in Norwich, on 3-6 September 2012. There were over 100 talks, 150 posters, a contentious debate on wind power, and a talk on how the UK can maintain its current research infrastructure. Over the next week or so Words in mOcean will be bringing you a recap of the best of the action, starting with four of the keynote lectures. Today’s recap is on the lecture given by Jorge Sarmiento, titled ‘A biogeochemical paradigm shift’. Enjoy! If you were to ask any ocean biogeochemist what their biggest wish is, it would undoubtedly be this: real time biogeochemical data (CO2, pH, nutrient concentrations etc.) collected from all regions (and depths!) of the ocean, 24 hours a day and 365 days a year (most people would ask for a night with their favourite pop/movie star, but we can be an odd bunch!). This dream, up until recently, has been unobtainable as historically these measurements could only be made on expensive research cruises. The speaker talked about how in the 1970s we had a good 2D understanding of the ocean (what goes on at, or close to, the surface); by the 1990s oceanographers had added depth (the 3rd dimension) to this understanding; in the last decade, with the help of autonomous collection equipment (such as Argo floats), we have started to add a time dimension to our understanding. According to the speaker, there are currently over 3500 Argo floats in the ocean, sending back data every 10 days as they pop back up to the surface from their pre-programmed sampling excursions. Currently, about 800 floats a year are being added to this total (by 27 countries). Although currently the sensors on these floats are fairly limited (temperature and salinity mostly), a number of biogeochemical sensors are being developed to measure in situ oxygen, nutrients (nitrate, phosphate, silicate), pH and optical properties – a small number of these have already been deployed. Additionally, floats capable of sinking to 6 km (2 km is the current limit) are being developed, and could be operational by 2016. The speaker then went on to talk about how the coverage of floats in the Antarctic Ocean is currently limited, and how as the Earth’s climate continues to change we need a better understanding of this region, which is responsible for up to half the oceanic CO2 uptake (even though it covers only 27 % of the surface ocean); is an area of high heat exchange with the atmosphere; and fertilises up to 75 % of the global ocean with nutrients north of 30oS. Currently, the scientific models in the Antarctic do not agree very well with observations. The speaker talked about a recent grant proposal to get better Argo float data coverage here in order to address this. As part of a research grant for increased Argo float deployment across the world’s oceans, between 27 countries, the speaker talked about plans to deploy 220 floats (equipped with biogeochemical sensors) at a cost of $65,000 each(! ), across the Antarctic Ocean. 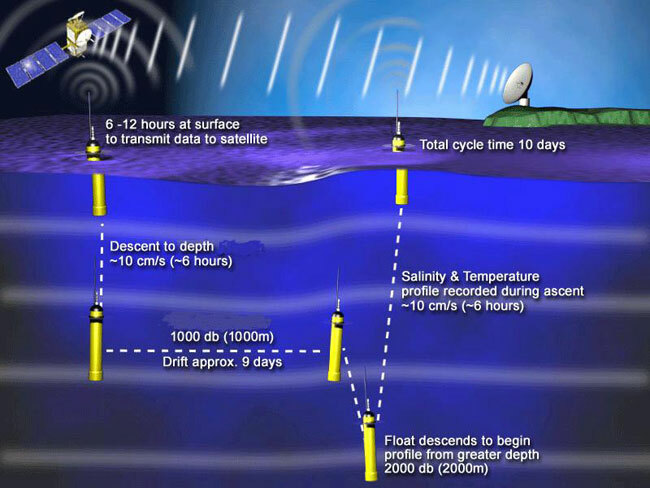 The grant, if successful, will also allow for the deployment of more Argo floats, with biogeochemical sensors, across the rest of the world’s oceans. At a potential cost of $500 million, this won’t come cheap, but it may be an important first step for achieving the real-time biogeochemical information that ocean biogeochemists have always wanted: allowing them to capture real time information for calibration of high resolution climate models, as well as increasing our understanding of key processes such as primary production, export production and remineralisation, and nitrogen fixation and denitrification.